I’d love to tell you about my newest book. It’s called Soup Night, and it’s about a subject that is very close to my heart: how sitting down to enjoy a meal together brings people closer. 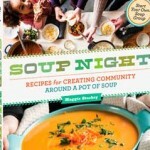 Along with 140 delicious recipes, it’s filled with stories of neighbors around the country who have built a genuine community through the simple act of getting together regularly for a soup supper. The process is really quite simple, but the results are extraordinary. Click here for the full story. 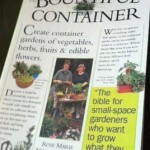 And if you’re interested in container gardening, take a look at The Bountiful Container, which is all about growing good things to eat in a patio garden. More details here. My other books fit into bookstore categories called gardening, cooking, entertaining, but at the core they’re really all about the same thing: living well and gently on the earth. I hope you’ll enjoy exploring.